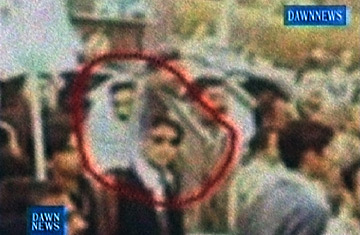 A TV frame grab taken on December 29, 2007, shows a still image of a suspected gunman (in sunglasses) and suspected suicide bomber (in white scarf) near Pakistani opposition leader Benazir Bhutto's vehicle (not pictured) in Rawalpindi. With rumors of government complicity in Benazir Bhutto's assassination rife throughout Pakistan, the country's stability may depend on the absolute transparency of the investigation into the murder. But a constantly evolving and sometimes contradictory explanation of the events by Pakistani investigators has only clouded the issue. Meanwhile, her husband and her supporters are asking for a United Nations-led inquiry into her death, something Pakistani President Pervez Musharraf is unlikely to accede to. But even if Musharraf were to agree, there is very little for international forensics experts to investigate. Within hours of the attack in the garrison town of Rawalpindi some 10 miles from the capital, authorities had already hosed down the streets. Pools of blood, along with possible evidence such as bullet casings, DNA samples from the bomber and tracks had been washed away. Retired Lieutenant General Hamid Gul, the former director general of Pakistani Intelligence, said he was shocked to see people cleaning up the debris so soon after the assassination. "It's a crime scene, and they're washing away all the evidence! We need to be asking why the hell was this thing done." One of the few pieces of evidence from the crime scene that remains is amateur footage showing a clean-cut man in a black vest brandishing what appears to be a gun. Behind him stands another man, a white scarf wrapped around his head. It is thought that he might have been the suicide bomber. The situation had already been muddied by contradictory versions of how Bhutto died. Initial health official reports stated that Bhutto had been shot twice before a suicide bomber detonated himself seconds later. But by Saturday, the government reversed track. Bhutto had been shot at, said Interior Ministry spokesman Javed Iqbal Cheema, but the shooter missed. The force of the explosion knocked Bhutto, who had been waving at the crowds from her vehicle's sunroof, backwards. She hit her head on a protruding lever, and succumbed to the fractures to her skull. Cheema presented X rays to support his claim, but witnesses and close friends who rushed Bhutto to the hospital say that there was no doubt she had been shot. Doctors who had attended Bhutto immediately after the attack initially said that she died of gunshot wounds, but over the weekend they released new findings in line with the Interior Ministry's claim that the official cause of death was head wounds sustained when Bhutto fell. The reversal has many people suspecting government interference. Says Chaudhry Nisar Ali Khan, an opposition member of the National Assembly and a former petroleum minister: "The government says it was the work of terrorists and they say someone has claimed responsibility. What I don't understand is why they keep changing the story of how Bhutto died? Why do that? These summersaults make everything look suspicious." Khan says he is naturally skeptical of talk that the government could be behind the assassination but says that their inept handling of the investigation only adds to the rumors. The idea that Bhutto died when her head hit a lever as she was pushed down into her open top car is "ridiculous." He also says that the government is not serious in investigating incidents like last week's. "How come, at least in the last three years, there have been scores and scores if not hundreds of bomb blasts and suicide attacks in Pakistan and the only incidents that resulted in people being arrested and sentenced is in the two attacks on Pervez Musharraf?" An autopsy would have been the obvious solution to the ongoing debate, but Bhutto's husband Asif Ali Zadari declined one at the time of her death, explaining at a news conference on Sunday that, "It was an insult to my wife, an insult to the mother of the nation. I know their forensic reports are useless. I refuse to give them her last remains." The government has since offered to exhume the body, which was buried Friday, in order to perform a post-mortem  but it may be a case of too little, too late. Doing so now only risks inflaming tensions. Islamic traditions hold that the body is sacred, and must not be disturbed in death. As expected, Bhutto's family declined the offer. As for who plotted the assassination, that too is clouded by what many see as either government incompetence or a knee-jerk choice of "usual suspects." On Friday, the Interior Ministery claimed that investigators had intercepted a telephone call that proved that Baitullah Mehsud, a leader of the Pakistani Taliban thought to be affiliated with al-Qaeda, had instigated the attack. Ministry spokesman Cheema released a transcript of a purported conversation between Mehsud and a follower, offering congratulations for a job well done. But Bhutto supporters are skeptical of the reports' veracity. "We do not know if it is a genuine transcript or one created by the intelligence agencies," says PPP party spokesman Farhatullah Babar. Mehsud has become a convenient scapegoat in recent terrorist attacks, sometimes standing in when investigators turn up empty-handed. Speaking through his spokesman to the BBC, Mehsud denied any involvement in the attack, as he did when he was accused in the October 18 suicide bombing at a Bhutto rally in Karachi that killed some 140. Such denials, of course, are meaningless, but they do exacerbate rumors of government complicity, a situation that benefits an anti-government insurgency. "There is a very strong possibility that the intelligence agencies were behind the attack," Mehsud's spokesman told the BBC. The government pirouettes may have less to do with a possible cover-up of an Administration-led assassination than a poorly executed attempt at damage control. If Bhutto was killed in a deliberate attack by a sniper, the government would have much more to answer for than if she was the victim of an arguably less-focused terrorist bombing. Bhutto has been dogged by terrorist threats since she returned to Pakistan on October 18; attending a rally and waving to crowds from the sunroof of her car was clearly a risky undertaking. And the government can argue that providing security under such conditions is impossible. "Look at our country," says Abdul Sattar, a former foreign minister under Musharraf. "Ask whether anyone could get security. I do not know while moving on a street with the supporters lining up along the side, front and rear, whether our security authorities have the capabilities to have a wall of security around the car." Bhutto's supporters have demanded an international, independent investigation into the events leading to her death. California Congresswoman Nancy Pelosi, the Speaker of the U.S. House of Representatives, said that Washington needed to answer some "troubling questions" about Pakistan's investigation so far. At yesterday's press conference, Bhutto's husband Zadari demanded a United Nations investigation, saying "We want a [assassinated Lebanese Prime Minister Rafik] Hariri commission-style investigation... we are writing to the United Nations for an international probe into her martyrdom." According to Dawn, a local newspaper Pakistani President Pervez Musharraf said that he would "consider" outside help during a phone call with British PM Gordon Brown yesterday, which many are interpreting as a "thanks, but no thanks" dismissal.